Why hire a Ford Mustang? If you’ve ever dreamt of driving a classic Ford Mustang, this is your opportunity to have a proper V8 experience in our iconic 1969 fastback Mustang hire car. You really don’t need in car entertainment when you’ve got a 5 litre V8 soundtrack playing! Our Mustang hire car in Yorkshire looks fantastic and sounds awesome. Rebuilt in the style of a Boss 429, the looks speak for themselves. Mustangs gained worldwide fame when driven by Steve McQueen, the king of cool, in the film Bullitt. Does our car live up to that? We certainly think it does, although we’d prefer you to drive it somewhat more carefully! If you’ve a special occasion in mind or just want to cruise around, hiring this classic Mustang will get you noticed. An American muscle car hire makes for a unique gift a loved one wouldn’t ever expect. Use it to turn up at a prom or a wedding and all eyes will be on you. 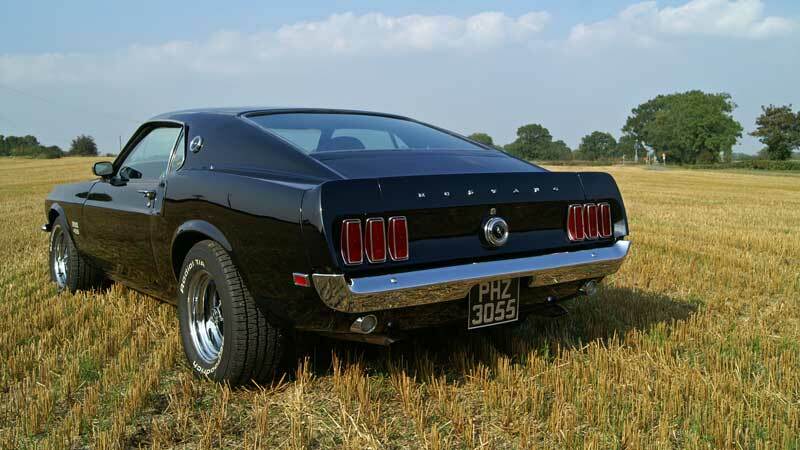 This Ford Mustang fastback must be the coolest American muscle car to hire in Yorkshire, Lancashire and the North West. Our Mustang hire car was built at the St Jose plant in the golden state of California in 1969, and lived in the USA for most of its life. It was imported into the UK and restored in 2013. Compared to the first generation Mustangs of the mid 1960s it is slightly longer and has a more muscular appearance. 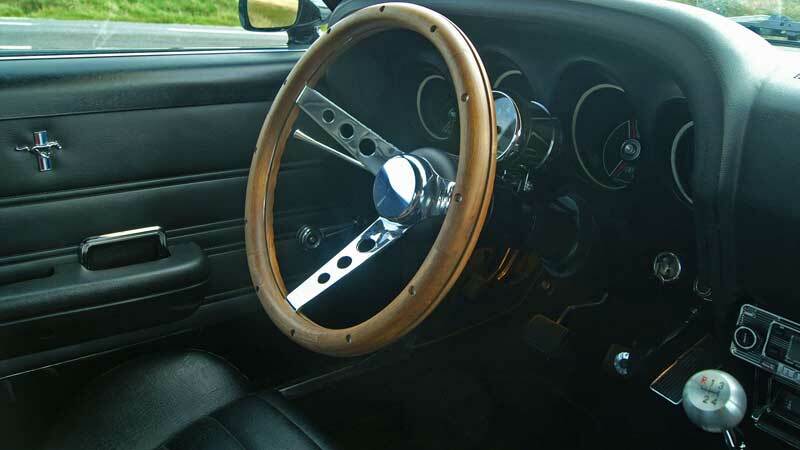 Finished in black with black interior trim and wooden steering wheel, it has undergone a full bare metal restoration, being rebuilt to look like the rare and famous Boss 429. 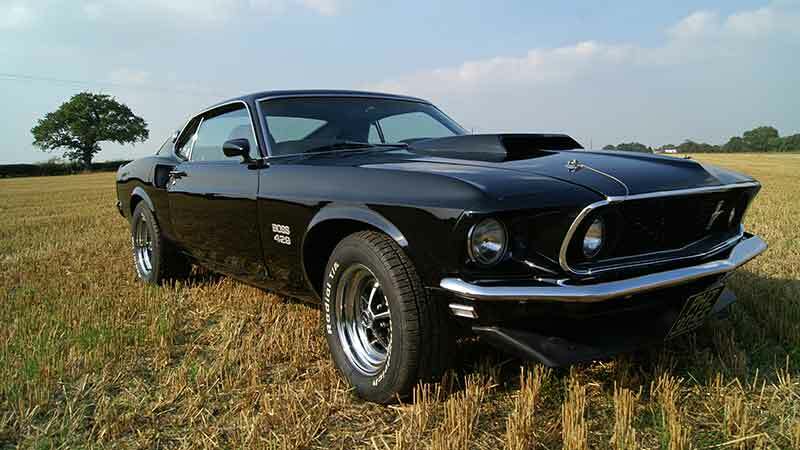 The Boss 429 had a 7 litre engine. Ours has the 69 Mustang Fastback’s original 302 V8, but it’s still very powerful and not for the fainthearted. With a 4 Speed manual transmission, giant sized hood air scoop and front air dam, raised white letter tyres on 15” Magnum wheels, this car looks the business. It has all the authentic finishing touches you would expect to see on a 1960s American Mustang, even down to the characteristic chrome bonnet pins. The Ford Windsor 5.0 litre 302 cubic inch V8 engine is tuned to 277 horsepower. It has a 4 barrel Edelbrock carburettor, and manual 4 speed top loader gearbox with Hurst chrome shifter. In addition it is fitted with a ‘Monte Carlo’ brace to reduce body flex on the front suspension. Please note that this car is left hand drive, and you can only hire it between 1 April and 30 November each year. 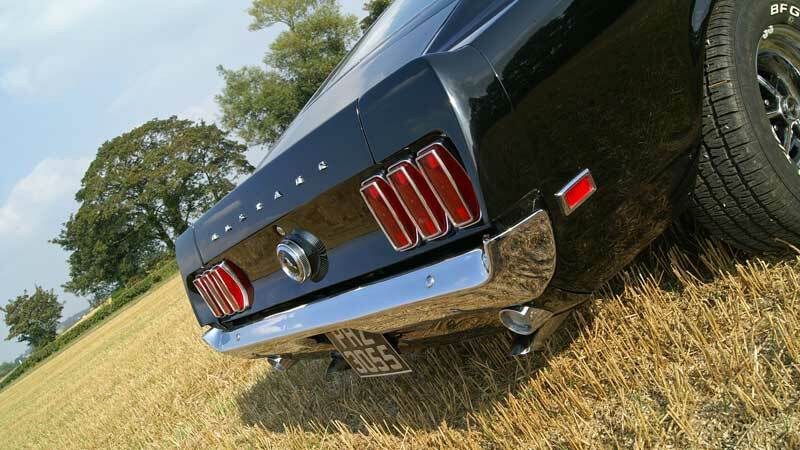 Ford Mustang Hire in Yorkshire for the ultimate American classic car driving experience. Ford Mustangs have been in production for over fifty years, but the many variations of the classic Mustangs produced between 1964 and 1969 are the most acclaimed. Many regard the Mustang to be one of the best American muscle cars of all time. 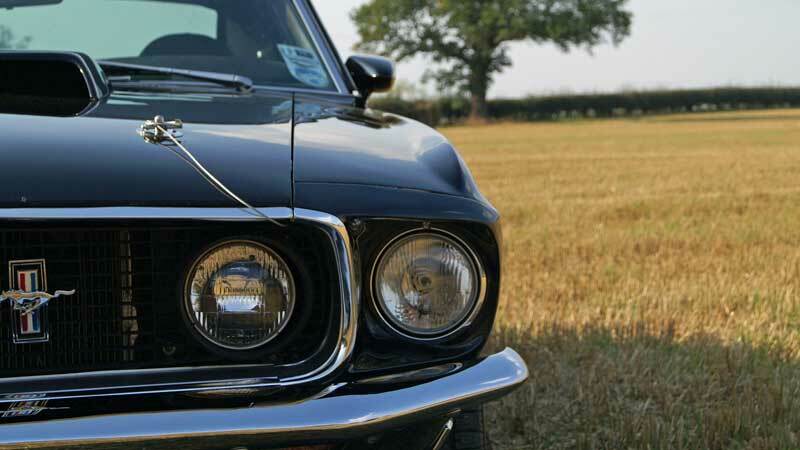 There were three body styles produced – the Fastback (also known as sportsroof ), the notchback and the convertible. According to Hemmings (a long established American classic car sales company) it’s the Fastback that is now the most-desired and valuable early Mustang. Their explanation for this is that there were more notchbacks made than any other body style, so there are more of them for sale. Our explanation is that the Fastback just looks so much better, and the 69 is the best of the best. First generation Mustangs were released in 1964, with production running through to 1966. They were an instant success, with Ford reputedly selling 22,000 on the first day. The Mustang’s place in history was secured. It was one of the “pony car” class of American automobiles – sports car like coupes with long hoods and short rear decks. Marketing for the Mustang was oriented towards the younger generation, offering sporting style at a reasonable price. Many options were available to individualize each car. Famous American racing driver Carroll Shelby raced the 1965 model as the GT350. Second generation Mustangs were produced between 1967 and 1968. In response to competition from manufacturers such as Chevrolet and Pontiac, Ford produced a slightly larger Mustang with embellished styling features. The cars were wider, longer and with bigger engines. Because of the wider track, the ’67 Mustang was a more stable car than the ’66. It was, generally speaking, a better car in every way that mattered. This is the Bullitt era Mustang which gave it the image of the bad boy car of the 1960s. Third generation Mustangs where produced between 1969 and 1970. 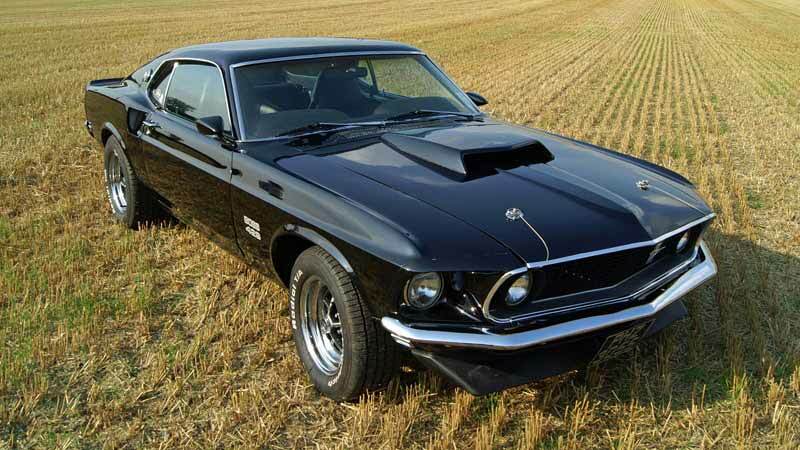 The ’69 model featured four headlights and a sharp nose and simpler grille, with the more powerful 302 engine replacing the 289 V8s of previous generation Mustangs. Almost 300,000 cars were sold that year, of which ours is one. “Somebody finally built a better Mustang” declared Ford’s sales literature. The ’69 Boss 429 on which our classic fastback Mustang is styled, was one of the rarest and most powerful models. Like the Boss 302, it was built for racing. The project to build a high performance Mustang was done in secret, so when the chief designer Larry Shinoda was asked what he was working on he answered “the boss’s car”, and that’s where the name came from. Mustangs have starred in a number of films – ‘Bullitt’, ‘On her Majesty’s Secret Service’, ‘Fast and Furious 6’ and both the original and the remake of ‘Gone in 60 Seconds’. 302 cubic inch V8 (approx. 5000 cc), Ford Windsor engine. Tuned to 277 horsepower. 4 barrel Edelbrock carburettor, Edelbrock inlet manifold and MSD electronic ignition. Magnum 500 wheels with Goodrich radial tyres. 2 door, 4 seater coupe. Lap and shoulder seatbelts in the front, lap belts in the back. Boot is a bit on the small size given the size of the car, but there is a fair amount of space behind the rear seats, or the rear seats can be folded down to provide extra luggage space. Our Ford Mustang hire car is available for collection in Keighley, West Yorkshire. Our location is within easy reach of all the major towns and cities in the north of England. We are in an ideal location for Ford Mustang Hire Leeds, Bradford, Halifax and Huddersfield. For Ford Mustang hire Preston, Blackburn, and Burnley, Lancashire, you don’t have too far to travel either. We are within an hour’s drive of most of the towns in Lancashire via the M65 or A59. Manchester Ford Mustang hire is within 50 miles of our Keighley base. 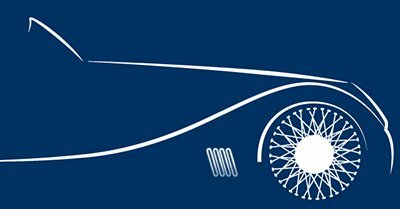 Once you’ve collected it you can drive our Ford Mustang hire car anywhere in the UK subject to our terms and conditions.